Florida Book News: Florida Eco-Thriller A Finalist For “Best Books 2011” Award. Florida Eco-Thriller A Finalist For “Best Books 2011” Award. Mangrove Underground, former Florida journalist Tim W. Jackson’s debut novel has been named a USA Book News “Best Books 2011” Award finalist for literary fiction. USA Book News announced the award winners and finalists November 1, 2011. Winners were chosen from works published by Simon & Schuster, St. Martin’s Press, Random House, Penguin, Harper Collins, Houghton Mifflin Harcourt, McGraw-Hill, John Wiley & Sons and hundreds of independent publishing houses. Set in the Florida backcountry, Mangrove Underground has its roots deep in the state’s eco-thriller tradition. Yet it subtly subverts the expectations of the genre with its story of one man’s betrayal and redemption before a backdrop of wildfires, environmental extremism and real estate skullduggery that could have been pulled directly from today’s headlines. A former press photographer in central Florida, Jackson gained first-hand knowledge of backcountry firefighting while accompanying fire crews battling wilderness blazes. Following a 10-year journalism career, Jackson returned to academia to earn a Master of Arts in English at Southern Methodist University in Dallas, Texas. His non-fiction travel writing about the Florida wilderness has appeared in the Tampa Tribune. His short fiction has appeared, or is forthcoming, in the High Plains Literary Review, Confrontation, Palo Alto Review, Oracle Story and Letters and Conceit. Jackson currently works as a boat captain and scuba instructor at Conch Club Divers on Little Cayman. He is finishing a second novel, set in the Caribbean, as well as a related collection of island-based short stories. 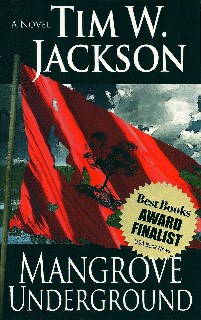 A portion of the proceeds from copies of Mangrove Underground purchased directly through Jackson’s website, www.timwjackson.com, will be donated to the Nature Conservancy’s Coral Reef Preservation Fund, established in 2011 to benefit the study and conservation of coral reefs in Florida and the Caribbean. Florida Book News on Kindle Blogs.